This page is intended primarily for the coordinators for trail work days. 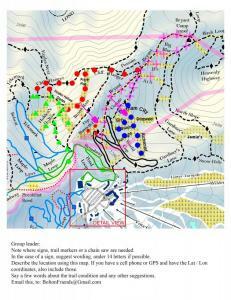 Here are the trail work maps with instructions. Download, and make copies for your day’s trail clearing groups. Typically four work groups go out each Saturday. To down load to a PC, click once to enlarge the image, then right click and choose “save image as”.